Full rehaul of the Ki-43-II flightmodel. This was a very maneuverable and fast turning Japanese fighter, very similar to the A6M3 Zero. See further down for details. Full rehaul of the Ki-44-IIc flightmodel. 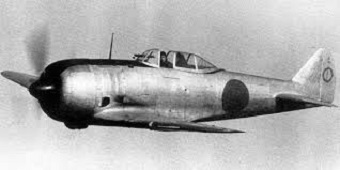 This fighter was different from other Japanese fighters in that it had small thin wings and was designed for speed rather than turning ability. See further down for details. Brewster Buffalos, Polikarpov I-16, Macchis, Fokker D.XXI, MiG-3, Hawker Typhoons, P-39 Airacobras, J2M's, Ki-43, ki-44, Ki-61's & Ki-84. A few minor corrections to the flightmodel. Slight increase to manual trim allowance. 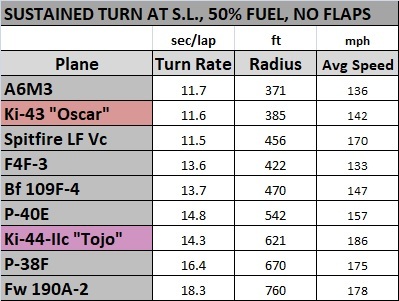 Landing gear brake efficiency reduced. The I-16 was reported to have quite poor brakes. Fuel tank system retweaked (93.8 gal fuselage tanks, 2x 39.6 gal wing tanks). Wheel brakes tweaked so that the plane won't nose over as easily. Hurricane I, Hurricane I *87 octane, Sea Hurricane Ib, Spitfire I, Spitfire I *87 octane and Spitfire II. Now has the neg G's cutout performance like the Spitfire Vc. This since the Spitfire IXa also used the "Miss Shilling's Orifice" quick fix for the carburetor, not the Bendix Stromberg carburetor like the Spitfire IXe. The Ki-43-II was a Japanese land based fighter designed for superior maneuverability. It was light and had a good wingloading, fielding the Nakajima Ha-115-II radial engine capable of 1174 hp at 2800 m (9200 ft). This engine is quite similar to the Sakae 21 engine of the A6M3 "Zero", and in fact the Ki-43-II is very similar to the A6M3 in both speed, climb and turning performance. It has a low top speed for it's era, but has an excellent turning performance. It's dive performance is very poor so the Hayabusa will have a hard time catching Allied fighters diving out. The armament is also quite weak with only 2x 12.7 mm machine guns in the nose. That being said though at slow speeds it's an excellent fighter that can easily outmaneuver and out turn fighters of the same era, and it was quite liked by the Japanese army pilots. It's butterfly low drag flaps are also great for turn fighting. The Shôki was very different from traditional Japanese fighter design in that it was built for speed, not turning performance. It's a large nosed fighter with small and very thin wings, fielding the strong Nakajma Ha-103 radial engine capable of nearly 1600 hp at 2100 m (~7000 ft). It could match a P-38G in top speed up to 5200 m (~17000 ft). 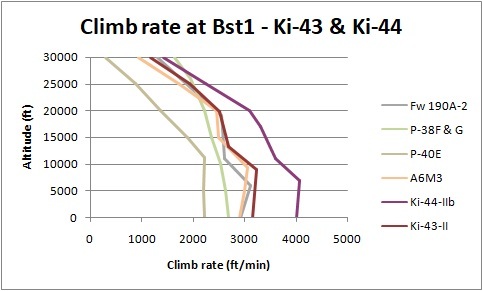 The most impressive performance of this fighter is it's climb rate though, outmatching most fighters of WW2. It's armament is decent with 4x 12.7 mm machine guns and the short wingspan gives it a good roll rate. 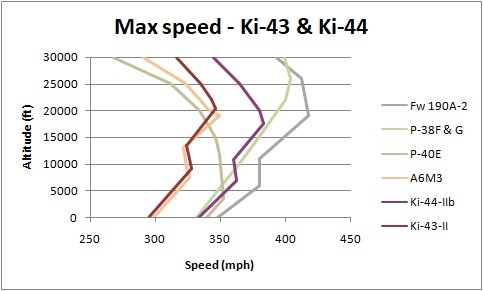 In contrast to the Ki-43, the Ki-44 is a very good diver and can sustain high speeds. It has no armored windscreen so machine gun fire from bombers can be dangerous. The thin small wings of the Ki-44 hampers it's turn radius at high speeds, but it's relatively light weight and strong engine still ensures that this bird is a decent turn fighter at slower speeds, especially in a spiral climbing turn. The low drag butterfly flaps also help improve it's turning performance. Overall the Ki-44-IIc Shôki is a quite competitive fighter, and had the Japanese Army pilots been better trained then it would have been a much more dangerous opponent for the U.S. pilots. Last edited by Robert on Fri Nov 09, 2018 2:08 pm, edited 2 times in total. This is awesome. For years we had to stay away from mid-war PTO battles. Now the P38s and F4Us will get some competition.